I can’t choose between Tim Hitchcock’s Down and Out in Eighteenth-Century London (Hambledon and London, 2004) and Amanda Vickery’s Behind Closed Doors: At Home in Georgian England (Yale University Press, 2010). I didn’t expect to end up in the Round Tower of Windsor Castle but the Royal Archives holds some fascinating records about the King’s Mews. At the other end of the archive spectrum, Sheffield Archives, a converted car showroom, also yielded gold dust from the Marquess of Rockingham’s stable records. But the most surreal moment was meeting descendants of the great Georgian brewers Samuels Whitbread I and II at their magnificent home, Southill Park House, to look at their paintings and sculptures of dray horses. This was great fun but also made me realise just how much London’s leading industrialists valued their horses. MUP has published some really important books about eighteenth- and early nineteenth-century British history over the last decade, not least Katrina Navickas’ Protest and the Politics of Space and Place (2017) and Samantha Shave’s Pauper Policies (2018). But I’ve also been impressed by MUP’s environmental studies, in particular Chris Pearson’s Mobilizing Nature (2012). More generally, I think there is a boldness about MUP and the books it publishes which makes it a great fit for City of Beasts. I’m at a crossroads. I may return to animals in the future but first I’ll be further investigating the social history of work in Georgian Britain. I’m also becoming increasingly interested in childhood, parenting and disability in this period. Watch this space. I first came up with the idea for City of Beasts thirteen years ago. I was pretty naïve about how hard it would be but if future me had burst that bubble I may have given up. As it was, I just enjoyed every step of the journey because I really believed that this book should exist and that this story had to be told. I never once doubted it and as an author that’s rocket fuel. Robert Hughes’ The Fatal Shore: A History of the Transportation of Convicts to Australia, 1787–1868 (Knopf, 1986). I read this during a special family reunion trip to Australia and was blown away by it. One of my ancestors was transported to Tasmania for stealing sugar in London in the early nineteenth century so I have a personal interest in this subject but it’s the razor sharp brilliance of Hughes’ writing that makes me jealous of his achievement. The way he weaves together big and small, people, nature, politics, beauty and horror left me spellbound. But perhaps more than anything, I respect this book’s humanity. I love art, in particular European modernist painting and sculpture from 1900–1940, so I enjoy reading about that. Afterwards, I’ll often have a go at imitating a masterpiece that I could never afford. Stone carving has been a great way to think (and stop thinking) about my writing. Working in research communications at the University of Cambridge, I read a dazzling array of articles and books about everything from anthropology to zoology, so that appeals to the magpie in me. I would ask cookery writer Hannah Glasse (1708–1770) to guide me in the kitchen and I would invite Oliver Goldsmith, James Boswell, Hester Thrale and Frances Burney from the eighteenth century. 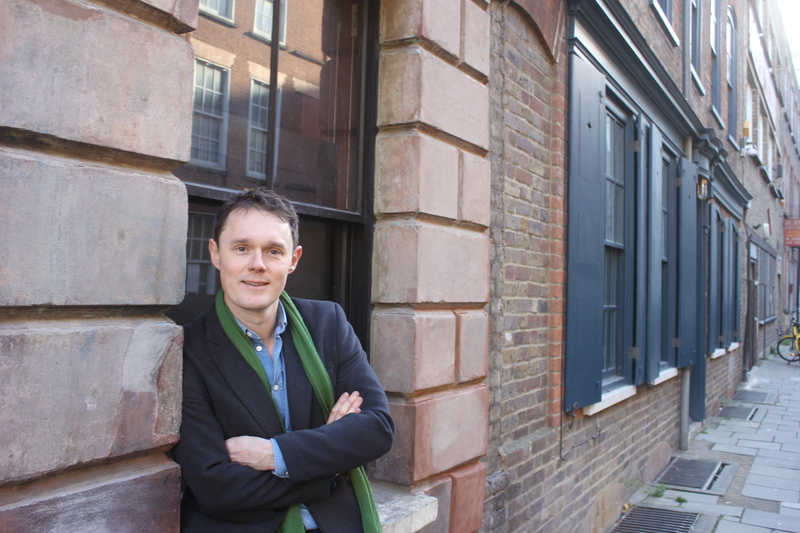 Into this mix, I would sprinkle some of my favourite living historians: Amanda Vickery, Hannah Greig, Tim Hitchcock, Roey Sweet and my PhD supervisor, Mark Jenner. I would also revive the legendary historians Mary Dorothy George and Roy Porter. 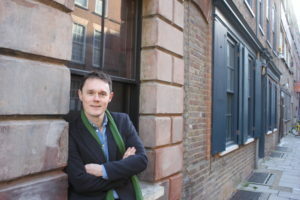 Thomas Almeroth-Williams is Research Associate in the Centre for Eighteenth Century Studies at the University of York. 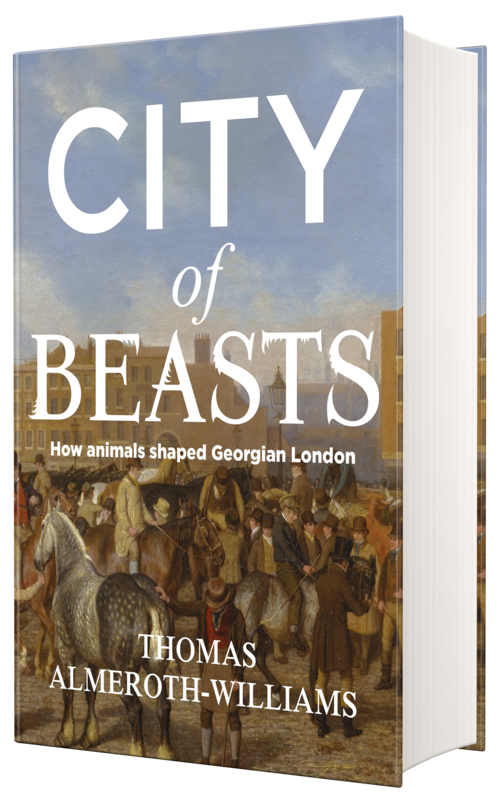 City of beasts is available to pre-order now and publishes on the 30th May 2019. 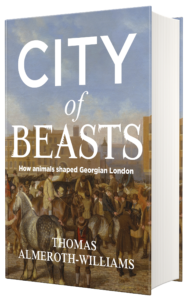 Join us to celebrate the launch of City of beasts at the Museum of London, on the 20th June 2019 as part of the ‘Beasts of London’ exhibition. More information can be found here. Category: Author Q&A, Blog, Events, History, Social History	0 Comments.